The texture of this dish, San Choi Bao(生菜包) is excellent, combining succulent minced pork with all other kinds of vegetables you like. Best of all, it’s very healthy. A story was spread around China that Qianlong Emperor (乾隆皇帝 Ching Dynasty) also had tried and commended this dish during one of his visits to Jiangnan. Well, it’s only a legend, yet many Chinese restaurants named this dish as “Qianlong San Choi Bao” (乾隆生菜包) in their menus to attract more customers. 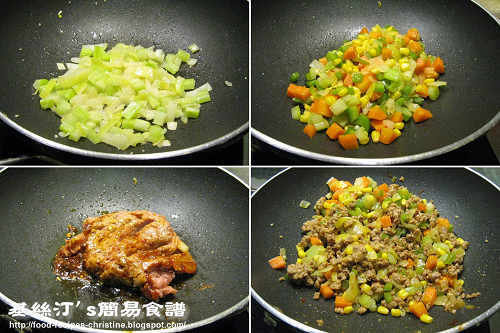 Mix minced pork with seasoning for 25 minutes. Blanch carrot cubes and corn kernels for 2 minutes. Drain well. Fry onion, half of minced garlic on medium heat until translucent. Add celery, capsicum and stir-fry for a while until tender. Add carrot cubes and corn kernels. Sprinkle with salt to taste. Set aside. Add 2 tablespoons of oil to sauté the rest of minced garlic briefly. Add Hoisin sauce, bean sauce and chili bean sauce to sauté until aromatic. Add minced pork and stir-fry until pork cooked through. Toss back vegetables to pan until all ingredients heat up again. 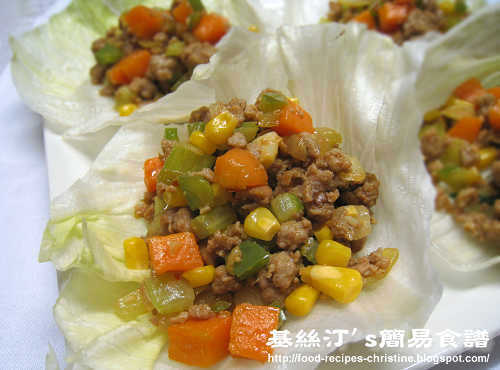 Pile mixture into lettuce cups. Serve hot. All sauces mentioned in this recipe are available at Asian stores. This recipe sounds delicious! I like your photos to go with it also. Thanks for dropping by and your encouraging words! Yeah, it tastes really gooooood! I also really like your recipes and your blog.. I am also from HK now living abroad and miss home-cooking. It would be great if you could get someone to help you a bit with the technical aspect as I really want to print all your receipes but it a difficult format.. Anyway, this is not a criticism.. just a wish... Keep up the good work. Actually, I've begun working back from the lastest recipes to install a print button and put the printable version up for each recipe. As I have to do it manually one by one, it takes lots of time and effort. So bear with me, the progress is a bit slow.